I loved Goon Squad a lot. I recommended it to pretty much everyone who walked into the shop in December and EVERY BODY LOVED IT. (Disclaimer: that may be an exaggeration, but a huge number of people came back in and told me they loved it and bought copies for friends. I only had one person come back and say they didn’t like it that much.) If I haven’t already recommended it to you, let me tell you about it. It’s a series of interconnected stories centred around Benny and Sasha who are record label people. There are stories from them, stories from people who are close to them, people who used to be in their lives, and some from people who you can’t figure out how they connected for ages. (That sentence sounds wrong. Thoughts?) Together the stories build up a picture of their lives from 1970s punk bands through success and the trouble it brings into musings on the near future of music. 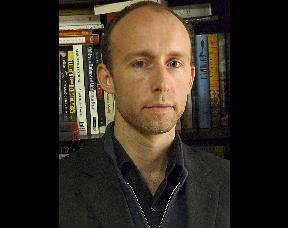 It’s a broad picture of time and people and music and failure and ultimately, for me, hope. It’s funny and sardonic and witty and quirky and beautifully constructed. You should read it. 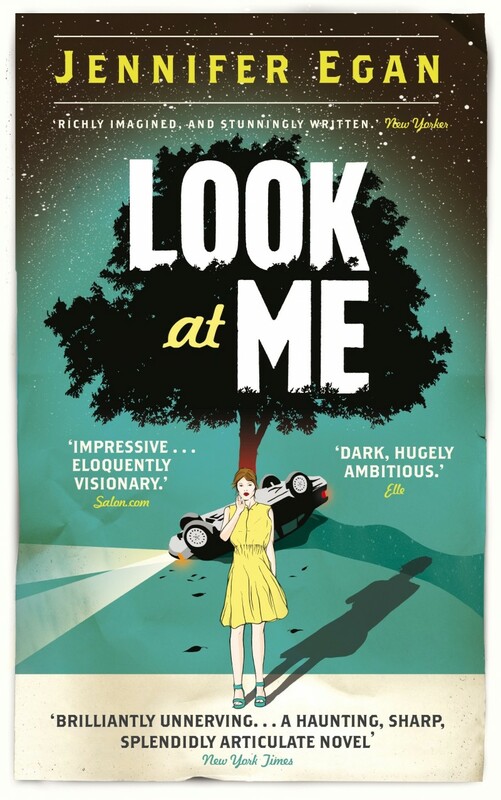 I’m thinking about Goon Squad today because we just received some copies of Egan’s novel-before-last, Look at Me, eleven years after it was first published in America. I am looking forward to reading it, although in a recent interview Egan recommended reading her novels in reverse order so I’m going to reed The Keep first. Here’s a fun fact: you couldn’t get any Jennifer Egan books published in Australia until after she found success with Goon Squad. I feel like Australian publishing is very conservative, as evidenced by the SEVEN oversubscribed print runs of The Street Sweeper that Random had to put out, and I’m still not sure if they’re too worried to do a bigger run. Anyway these are some thoughts that I am having on a Wednesday. I hope you’re having a lovely day and reading some exciting books. If you were absent for our very own Street Sweeper event back in…. I want to say October? Then you will be pleased to know that you have not missed out entirely! 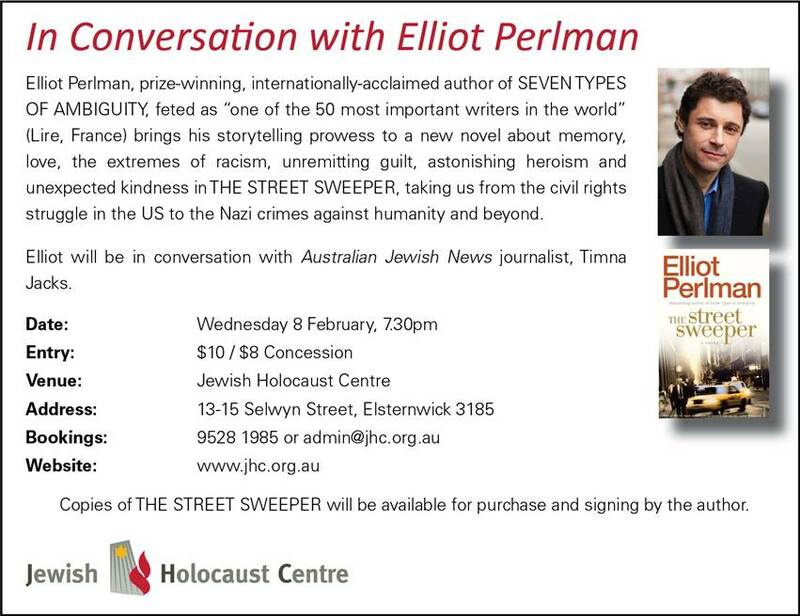 The handsome, charming and extremely eloquent Elliot Perlman will be speaking at the Jewish Holocaust Centre on the 8th of February at 7:30pm and we at Sunflower Bookshop will be listening attentively and selling books. Elliot is a great speaker and I definitely recommend coming along! The Art of Fielding hits a home run! sports day I have variously skipped it, protested it, started petitions against it and held picnics in the middle of the grounds. It probably started when I was an uncoordinated, chubby six year old, terrified of being hit in the face with something. Since I still possess these qualities as a 23 year old, I think it is safe to say I will not be joining a netball team or enthusiastically taking up bike riding any time soon. 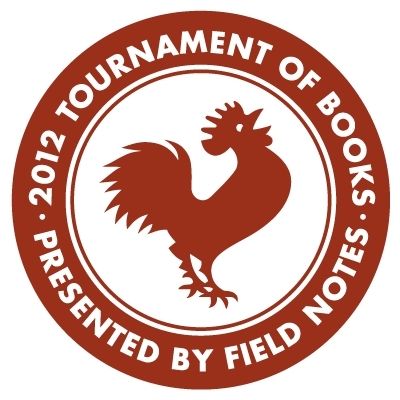 All this is to say: we would think a 500 page novel about baseball would not be the one for me. And that is where you and I would apparently both be wrong! It would be easy to say that The Art of Fielding isn’t really about baseball but about a group of different guys at college coming together and breaking apart. But it actually is a lot about baseball, and I found myself eagerly reading about plays and practises and games because the writing is that good. 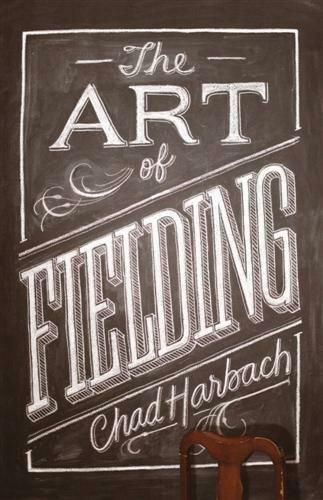 So whether or not you like sport I would definitely recommend The Art of Fielding. 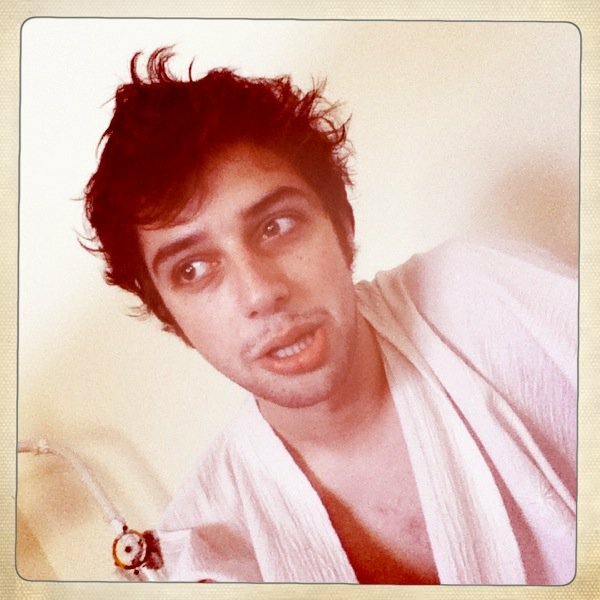 Zev, like a young Robert De Niro, is tough but with a comic streak. His knowledge of Judaica is second to none and he has the uncanny ability to locate a crazily misfiled book with only the power of his mind. Unlike Robert De Niro, he does not own a string of successful restaurants. Margaret is stylish and smart, with a dry sense of humour and a knack for predicting trends. If you’re after a book on art or cooking, or need to know what’s big in New York right now, she’s the one to ask. Deirdre is beloved by many, a woman of great height and great heart. Known to her friends as Dudley, she knows our kids section like the back of her hand. Dudley can always find the perfect book to make the child in your life laugh out loud, and she would appreciate that show of alliteration. Welcome to our inaugural post, by me, Fay Helfenbaum, the hippest of the Sunflower crew and voted fourth funniest Helfenbaum at our last dinner table poll. I’m lucky to have worked for a delightful three years at Sunflower Bookshop. During my time here I have talked to some of my favourite authors, met lots of lovely people, dressed up as a witch, read to a scary horde of preschoolers, become an expert on young adult fiction and read stacks of amazing books. My favourite book of all time is Vanity Fair by William Thackeray and my favourite author is Virginia Woolf. My favourite Sunflower section is young adult fiction and my weak spot is definitely history (both in terms of stock and general knowledge). I’ve just finished my undergraduate degree at Melbourne Uni with a major in literature (as well as economics, management and political science, because I am well-rounded) and working at Sunflower has made me realise that I want to pursue a career in publishing. Anyway since deleting my Facebook account I have a lot more free time and I am very excited to spend it on here, telling you all about my favourite new books and the exciting events we’re hosting.